"Burnout is a state of exhaustion and lack of motivation due to prolonged stress or frustration." I won't even bother asking if you've felt the effects of Burnout. It's not about being clinically depressed, it's not about being a mom. It's about trying really hard and not feeling like you're getting the results you want. It can be related to any aspect of life. Author and clinical counselor Julie de Azevedo-Hanks addresses this topic in her newly released book, The Burnout Cure. While her main audience is LDS women, the information in this book is not exclusive, and in fact applies to women and men of any belief system. From her years of professional experience and time spent on the lecture circuit, Julie noticed patterns among women - patterns of feelings of being overwhelmed, of not being able to succeed, of not being enough. Many of these feelings, she has found, stem from pressure from a misguided culture and even misunderstanding of Gospel doctrine. In answer to the compulsion to 'do it all,' Julie offers gentle and thoughtful counsel and guidance in regards to the place(s) from where our beliefs stem, as well as how to proceed in life in a healthy way. The book includes sections asking questions and encouraging pause for reflection. The Burnout Cure is filled with insightful, helpful information and ideas, intended to help anyone who has felt pressure and craved balance. 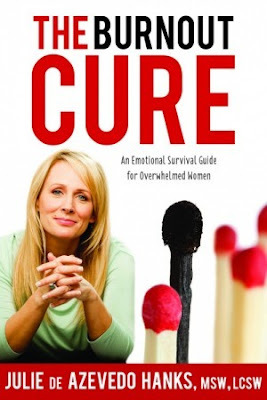 The Burnout Cure is available on Amazon. Or, of course, you could enter to win your own copy, for yourself or a friend! Please see the Rafflecopter widget below. Winner will be announced on Monday, August 19th, 2013. Good luck! I feel burnt out when I don't get one on one time with my husband. He's definitely one to give me encouragement and get me re-energized. When he gets busy at work and we are just too busy with life, it gets hard to spend the time together. Trying to please everyone and saying "yes" to every request. I'm keeping my fingers crossed! This sounds like an awesome book. I feel burnt out when I don't get any me time. I agree with the above comment, no me-time is a big deal. I also feel super burnt out when I'm trying to fulfill too many commitments at once. I feel burnt out focusing my attention on my husband and his health issues and purposely don't take "me" time because I want to help him so much. When I don't get enough sleep. When sometimes I set too high of expectations for others. Trying to do things for others, no me time. I feel burn out every are during back-to-school season! 9 years of teaching, and it never gets any easier to get ready! When I worry too much about things out of my control. I don't know what NOT feeling burned out is. Pick me.